Click on the title to find more information on that particular prop. 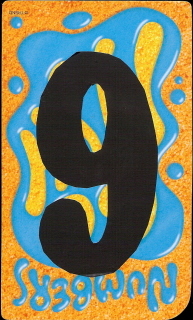 As described in Creativity For Entertainers Volume Three. 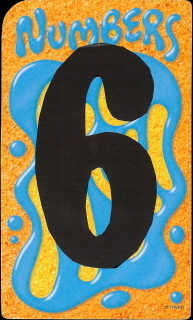 You show six cards of the same poker suit, the ace through six. You demonstrate they have their value marked on the back. 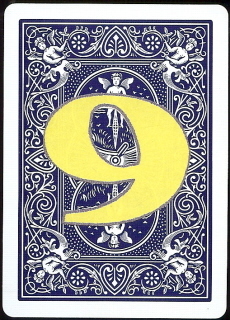 When you turn the last card around so the number on the back looks like a nine, the face changes to a nine. Uses a sleight that is easy to perform but deceptive enough to create a sense of wonder for audience members of all ages. Instantly reset making this ideal for strolling entertainment. You are the only one to touch the cards so it is infection control compliant making it ideal for caring clowns. 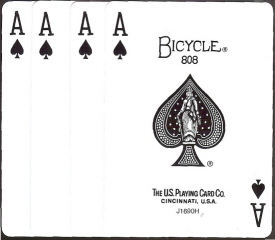 Pointer cards make it easy to keep the cards properly aligned. 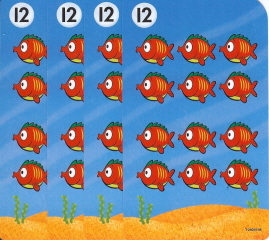 The same effect as Charlie's Marked Cards but with large Numbers Go Fish Cards. This size card is actually easier to manipulate. 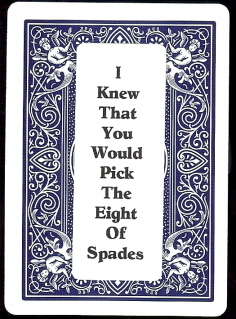 Audiences of all ages can relate to these cards. You can incorporate jokes about fish into your presentation. The change in the face of the card is immediately obvious. Uses a sleight of hand move that is easy for you to perform but deceptive enough to create a sense of wonder in all audience members. Instantly resets so it is ideal for strolling entertainment. You are the only one who touches the cards so this effect is infection control compliant making it ideal for caring clowns. Decks currently in stock are regular size Go Fish decks, with colorful sea creatures. 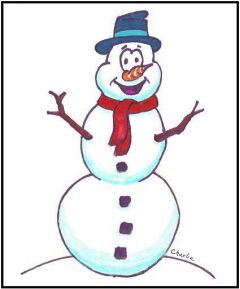 You display four cards each depicting a snowman. Suddenly each picture has started to melt. 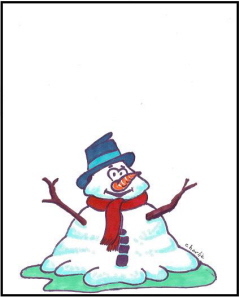 Then the snowmen melt a little further. Next they vanish completely. 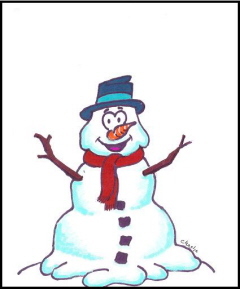 At the end the snowmen return. A plot everyone can relate to. Automatically resets making it ideal for strolling entertainment. Infection control compliant for caring clowns. Uses a sleight that is easy enough anyone can perform it, but that is deceptive enough to cause wonder in all ages. You display that you have four poker cards of the same value but each a different suit. When a card is selected, a prediction magically appears proving that you knew which card would be selected. The appearance of the prediction is a humorous surprise. Easy to perform so you can concentrate on interacting with audience members. Should not be repeated with the same audience. Pointer cards make it easy to keep cards properly aligned for maximum audience impact. 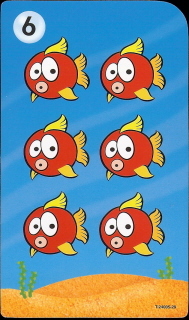 You show four matching face cards, e.g. 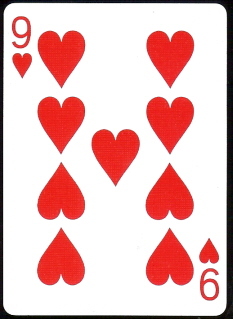 King of Hearts. Three of them are dealt face down onto the table to your right, and the last one is handed to an audience volunteer on your right. You show four more matching cards, e.g. Ace of Spades. Three of them are dealt face down onto the table on your left, and the last one is given to a second audience volunteer on your left. The audience volunteers exchange cards. They use their new card to tap the face of the face down pile in front of them. They turn over the cards to show that the rest of the cards have also switched places. 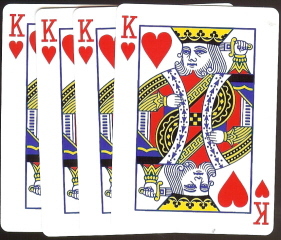 All the Kings are now on your left and all of the Aces are on your right. Easy enough for you to perform, but strong enough to create a sense of wonder. 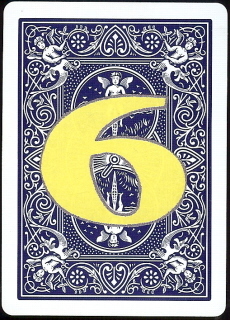 The cards in each packet vary, but they all have a face card of one color and a pip card of the opposite color for maximum contrast making the effect easy for the audience to see and understand. A plot that can be understood by all ages. Two audience members appear to perform the magic. 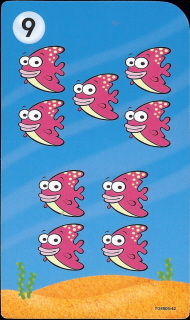 The same effect as Instant Wild Card described above except using large colorful fish cards. Cards are the same style as used for Charlie's Marked Cards so the two effects will go together well. 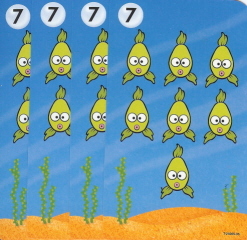 Every packet has four cards with twelve red fish and four cards with seven green fish making it easy for the audience to see and understand what happens. What Happens? A "spiritual bank" book is shown (The Ledger of Life). Listed on it's pages are sins and the price due for them. Death. The sins are listed in bold letters and so it the price. Death. Then, as the story of Jesus Christ is told, the pages in the book change. Suddenly, over the sins and their price are the letters "PAID IN FULL BY CHRIST'S BLOOD". These letters are in bright red! Finally, all the pages in the book turn blank. The blood of Christ not only paid for the sin, but also took their record away. The believer stands justified (just-as-if-I'd never sinned) before God! 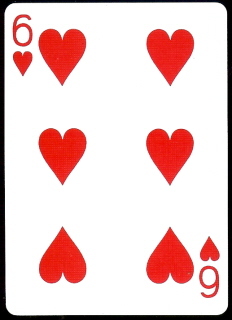 You have four cards, all of the same value, for example, four jacks. 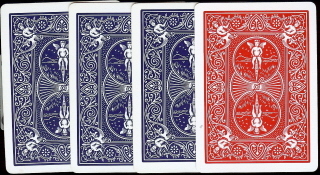 No matter which card is chosen, that card has a different colored back then the others. It becomes more amazing when repeated with the same audience. Instantly resets making it ideal for strolling entertainment. Concludes with all the cards being examined by audience members. You display a packet of four cards. When you tap them to square up the packet, the backs start to slide off. Tap them again and the backs slide off further. Tap them a final time and the backs have vanished. Excellent close up effect that creates a sense of amazement and humor. Does not reset instantly but the use of pointer cards and a numerical sequence makes it easy to align the cards properly in the right order with a minimum of thought eliminating mistakes. Limited to stock on hand, and then it will no longer be available.